Suleikha Snyder : Excerpt: Meet Taj from BOLLYWOOD AND THE BEAST! Excerpt: Meet Taj from BOLLYWOOD AND THE BEAST! My next Bollywood Confidential romance comes out on February 11, 2014, from Samhain Publishing. So, now is as good a time as any to introduce you all to my reluctant hero (okay, so he's a jackass), Taj Ali Khan. 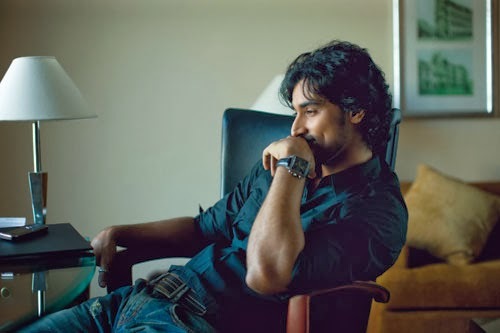 Check out the excerpt below this lovely (and appropriate) picture of Kunal Kapoor, one of the real-life visual inspirations for this beastly Bolly boy. Taj slouched in front of the large-screen TV as the highlight reel of his greatest hits played out in bright, bruising hues of green, purple and blue. His legs seemed to go on forever. His hips swiveled like Elvis Presley’s. He looked like a king, as befitting his name, if not the King. The unerringly cheerful host, rosy-cheeked and pretty, couldn’t have been more than six when his first picture debuted in cinema halls. And now she was lauding him like he was a veteran, worthy of retrospectives while still in his prime. Nahin, not his prime. His early goddamn retirement. “Aur ab, Taj Ali Khan ka aakhri picture ki superhit song,” the girl simpered, as though his last film were a black and white from the ’40s. As if he wasn’t out in the world somewhere, watching his own bloody wake on a Bollywood “news” program. Ten years since his career had been declared dead, and the industry never failed to remind him that blood could still be squeezed from his dusty bones. His fingers closed round the controller, ready to pitch it across the room. Reprieve came in the form of his ringing mobile. “Yeh Dosti” from Sholay burst forth from the speaker. A playful ode to friendship was his baby brother’s idea of a grand joke, considering the state of their relationship most weeks. Their friendship had broken years ago, and they’d patched it together with strips of cello tape. “Bhaiya?” Though the term was respectful, Ashraf’s tone was anything but. Nahin, he was hurried, distracted, a bit irritated. “Who?” The women in Mumbai grew more and more unknown with every passing minute. Younger as well. He glowered at the screen, where the infant hostess was still prattling on about his legendary exploits. “Try heroic behavior yourself, okay, Bhaiya? We’re arriving tomorrow. Be civil.” Ashraf ended the call without any goodbyes. That was fine. Taj didn’t need any. Not when he was being eulogized by a horde of background dancers and his own perfect, unmarred face.